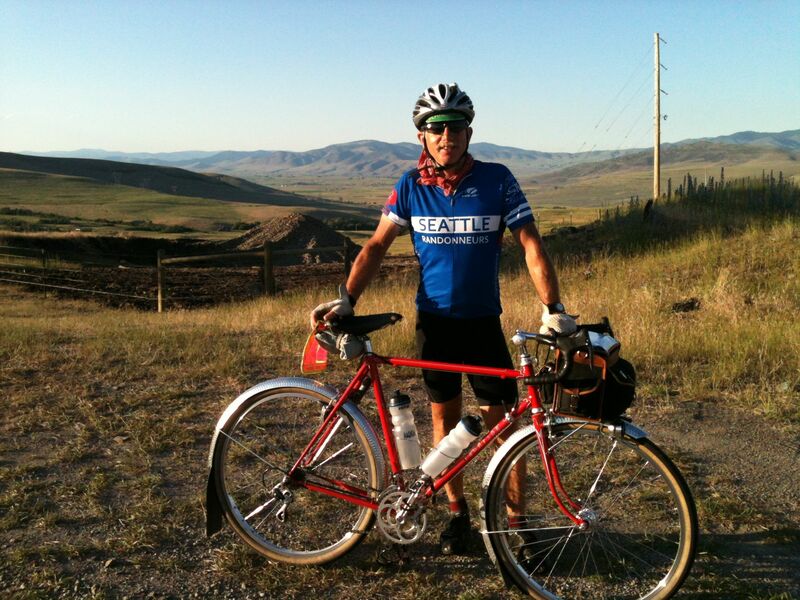 Last year I attempted to ride the Seattle to Glacier 1000km brevet in hopes of earning an R5000 award. Lots of things didn’t go according to plan and I quit around 400km into it. 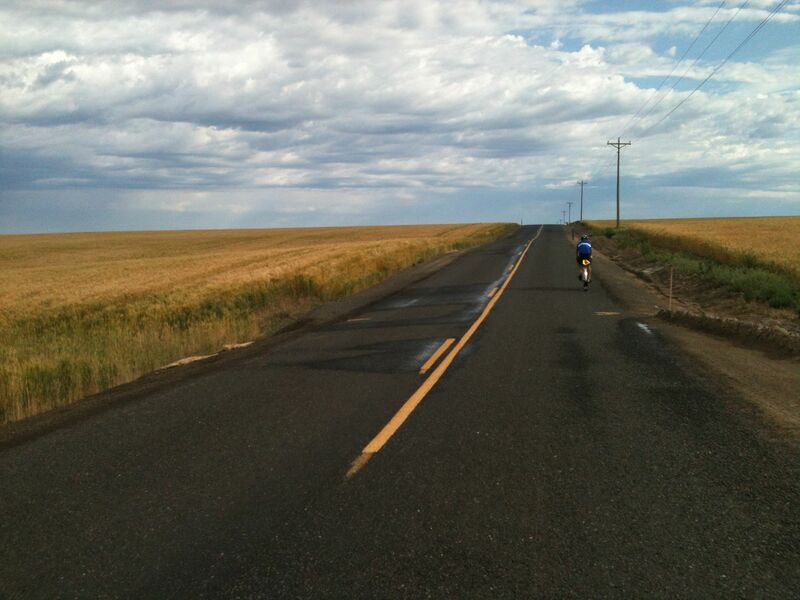 Riding in the hot, dry, windy conditions of Eastern Washington has always intimidated me and that was that. A month or so later, I rode SIR’s Crater Lake 1000 and it was perhaps the best ride I’ve ever done. The memory of last year’s failure must have softened a bit though, because when my buddy Andy suggested trying again, I let him talk me into it. “C’mon,” he said, “you’ve got unfinished business… I’ll ride my new bike and you’ll have two Thompsons complete the event, it’ll be great!” A number of my favorite riding partners also signed up so by the time I rolled away from the coffee shop on Mercer Island, I was feeling pretty good about the whole thing. No one seemed very eager to roll out and I realized that I was at the head of the pack, save for one ambitious fellow who quickly disappeared from view. Soon the stronger riders began to apply some effort, I stopped for a second to remove a layer; and I was relegated to the back. Andy was right there with me. At Greenwater, after we’d been climbing gently for a few miles, we stopped at a store for food and water. A few of the others were just leaving. We let them go because it was the last store until Cliffdell, 85km later. 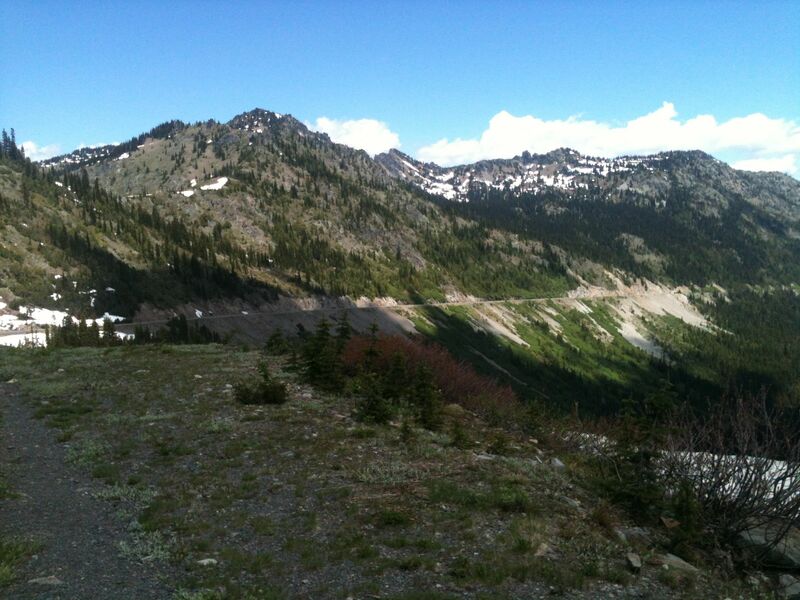 Chinook pass was breathtaking, but gave us our first taste of heat and I soon finished off all my water. There was a large RV parked at the summit and I caught the eye of a woman inside. She graciously gave me two bottles of water and we began the descent into the arid side of the state. At Cliffdell, (almost 1/5 done, or more than half way to the first sleep stop!) we were a bit behind the schedule I wanted to keep, but I was out of water again and pretty hungry. We could have gotten some “food” at the gas station and been on the road in a few minutes, but instead chose a sit down meal in the air-conditioned Whistlin’ Jack’s Restaurant. Walking out of the restaurant felt like stepping into an oven. As we rode, the terrain changed again, this time from dry foothills to fruit country. Soon it seemed we were directly in the center of a monumental orchard. Then suddenly there were buildings again and we arrived at the Yakima Fred Meyer where we got sandwiches and ice cream at the deli. I think every randonneur in the event must have talked to the same young man at the deli counter as well as the pre-riders because he knew all about us and was able to describe Vinny and John to a T! It’s really at Yakima that the monotony of Eastern Washington begins in earnest. We left town on the Yakima Greenway Trail, a refreshingly cool meander along the river. Soon though, we were on a straight flat highway bordered by hop fields. 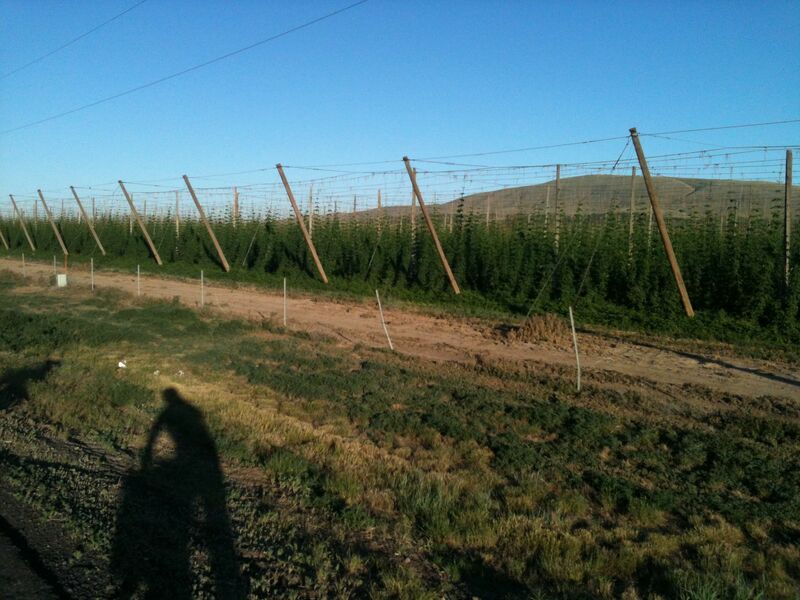 As the sun disappeared, the hops gave way to wheat and desert. It was around this time that I began to regret the large dill pickle I had eaten perhaps 20 minutes after my healthy serving of cookie-dough ice cream. Lots of riders seem to suffer gastro-intestinal problems on long rides, but I’m not one of them. Unfortunately, I was not so lucky that evening and was very happy to reach the restroom at the Vernita Rest Area. Andy had the appropriate medication in his bag and after forty minutes or so, I was able to continue. I don’t remember what time we finally rolled into the “overnight” contrôle in Othello, perhaps 2:00am, or 2:30. We showered, ate a few bites, and were in bed in minutes. A mere three hours later, the wake-up call jolted me from my slumber and I pulled on a complete clean cycling kit, prepared in advance and packed in my dropbag. The hotel was serving breakfast so, thinking of the heat and the need to stay hydrated, I gulped down some orange juice, some terrible coffee, and a bagel. When we stepped outside, we realized there were thunderstorms in the area and we actually needed our raincoats for the first 10-20km. The storm was moving faster than we were though, so we didn’t get much rain at all. I tried not to worry about the lightning and we began to make better time as we warmed up. We could tell it had rained hard in the night, every low spot was filled to capacity with standing water and all the ditches were flowing rapidly. The cloud cover was very welcome, in addition to the dramatic beauty of the sky, it kept the temperature down if only for a few hours. Late in the afternoon, we passed through the hamlet of Endicott. We stopped at the little grocery for ice cream sandwiches and sat on a bench in the shade for a few minutes. One of the locals stopped to chat and told us how he used to live in Seattle and ride a Rodriguez bicycle but he had moved his family out here twenty years ago because the cost of living was lower. It didn’t seem logical, but whatever, it takes all types! We sat there longer than we should have, but the shade was nice. The next control was Colfax, which we reached with a mere twenty minutes to spare. I don’t like pushing that close to the time limits, but the headwinds had been so bad all day we hadn’t managed to build up any time reserves. We had a sit-down meal of sorts at the local Taco-Time… another one of those places I usually wouldn’t be caught dead in but the air conditioning sure felt good! Unfortunately, though we had been on the road all day, we had only travelled a bit over 100miles which meant we had almost exactly 100 to go before our next planned sleep stop. Near the Idaho border, we made one more food stop at the Tekoa Market. It made sense to stock up here for the night in case we didn’t make it to Plummer, Idaho before the store there closed. A few more miles and one nasty climb later, we descended into Plummer where, luckily, the mini-mart was still open. I had a Cup-a-Noodles and thought to myself how wonderful it was that we were “almost there,” meaning almost to Kellogg and our next sleep stop. All we had to do was get on the rails-to-trails bike trail for awhile. We’d been riding with Joe since mid morning and he seemed to catch a second wind after we’d been on the trail a couple miles. He soon gapped us and we never saw him again. Meanwhile, Andy was getting sleepy and I was beginning to realize that “almost there” meant another 45 miles. I was very alert and eager to get to Kellogg, but not moving very fast. Andy was acting even more drowsy so I gave him a caffeine pill, which seemed to help. Every few minutes another mile post appeared to let me know that I was in fact getting closer to the objective and then suddenly we were there. I took a quick shower, had a snack, and was in bed less than twenty minutes after our arrival. There are aspects of riding a 1000 or 1200 kilometer brevet which remind me of the movie Groundhog Day. After another three hours of sleep, I have risen, zombie like, and donned a fresh set of cycling clothes from my dropbag. The hotel breakfast helped a little, but tasted mostly of cardboard. The sun hadn’t been up long, but it was already quite comfortable outside in shorts and short sleeves. We began the day by backtracking a few miles on the trail. I always find this part of the day to be particularly difficult. When I turned in last night, my body decided we were done, only to be rudely contradicted a short while later. The saddle feels hard, the handlebar feels too far away and too low, my neck and shoulders ache. Just like in Groundhog Day, here we go again. Ugh. Luckily, those feelings don’t usually last too long. After six miles or so, we turned north on Coeur D’Alene River Road and the scenery caused me to think of another movie, A River Runs Through It. I wish I had taken a few pictures, but it doesn’t matter. Pick any scene from the movie. At the 25 mile mark, we turned away from the river. A store provided the last provisions available before the next controle in Thompson Falls, Montana, still some 40 miles distant. I bought crackers and cheese for the handlebar bag, and an ice cream bar for immediate consumption. As usual, Andy dropped me on the climb and I slogged along on my own, wishing fervently for some shade. I drained the warm water from both my bottles and while it didn’t make me feel any cooler, I know it helped keep me hydrated. Eventually, the heat was too much and I found a tiny patch of shade to stop in. I sat on the ground and drank the last of my water, trying to cool off. It wouldn’t do to make it this far into the ride and give myself heat stroke by pushing too hard. Just then, John and Jim, the ride organizers, drove past and stopped. They filled my bottles with ice water and offered words of encouragement before leaving to find the others. I felt much better and pedaled another mile or two up the hill where I found Andy sitting in the shade next to a tiny waterfall. We soaked bandannas in the cold water and tied them around our necks before continuing. 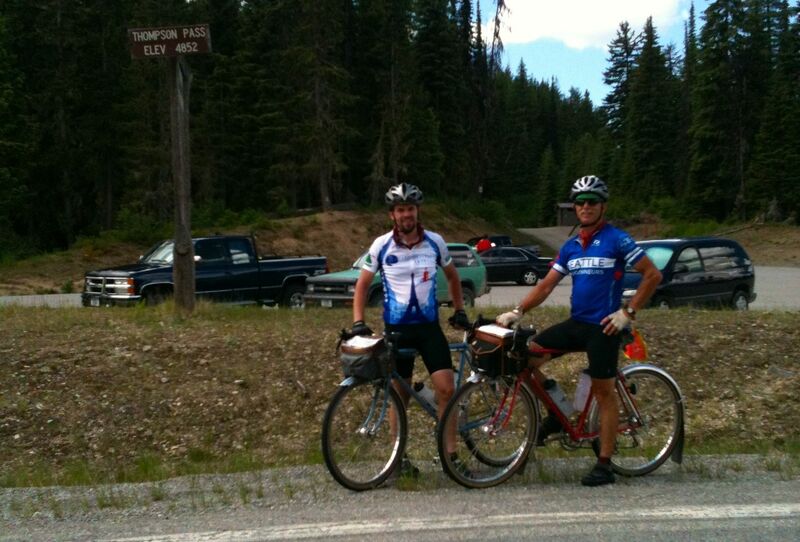 John and Jim were waiting at the summit and graciously took our photo: Thompson at Thompson Pass! We congratulated each other on having ridden our bicycles all the way from Seattle to the Montana border in two and a half days, then began the long descent. What a reward! 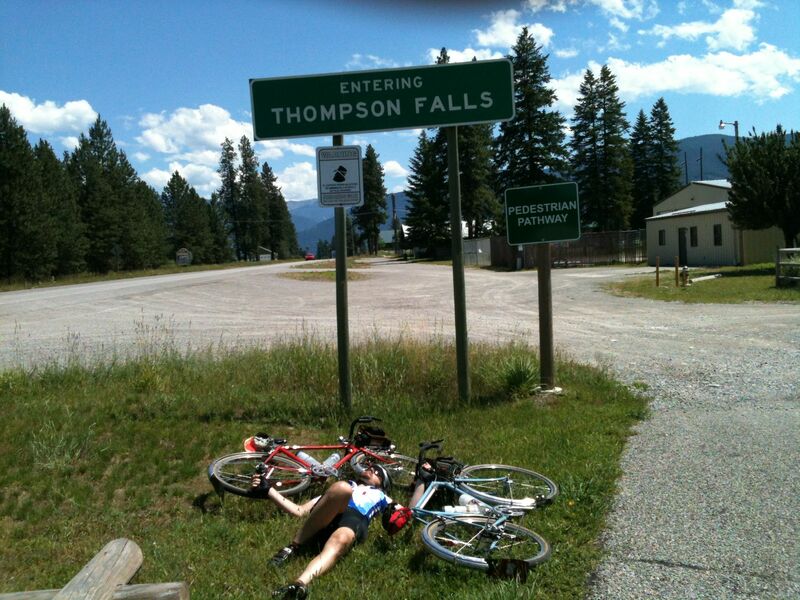 As soon as we saw the city limits sign for Thompson Falls, I told Andy we had to stop for a photo: I posed in front of the sign with two Thompson bicycles, as though we had all fallen there. It was hilarious at the time! Someone asked me how I hang on to my sense of humor on these long rides. I think most often it’s the only thing keeping me going. Bad jokes keep us awake at night and in the daytime, things which are only moderately funny become side-splittingly so. One of the highlights of this ride is Minnie’s Montana Café, in Thompson Falls. Thompson Falls is also a controle, so if one has time “in the bank,” it makes sense to stop for a proper meal. I noticed Ken’s bike outside when we rolled up. We hadn’t seen him for more than 40 hours so it was nice to say hi, especially since this was his first 1000. He paid his bill and left just as Andy and I were ordering food. We had our brevet cards on the table while we waited for our food. Not long after the waitress took our order, she returned holding a brevet card. It turned out Ken had left his behind. She asked if it was important and if we could return it to him please? I’ve always dreaded losing my card on a brevet. Not much worse could happen, but not much better could happen than having a thoughtful soul return it! We had a good laugh and headed back out into the heat. 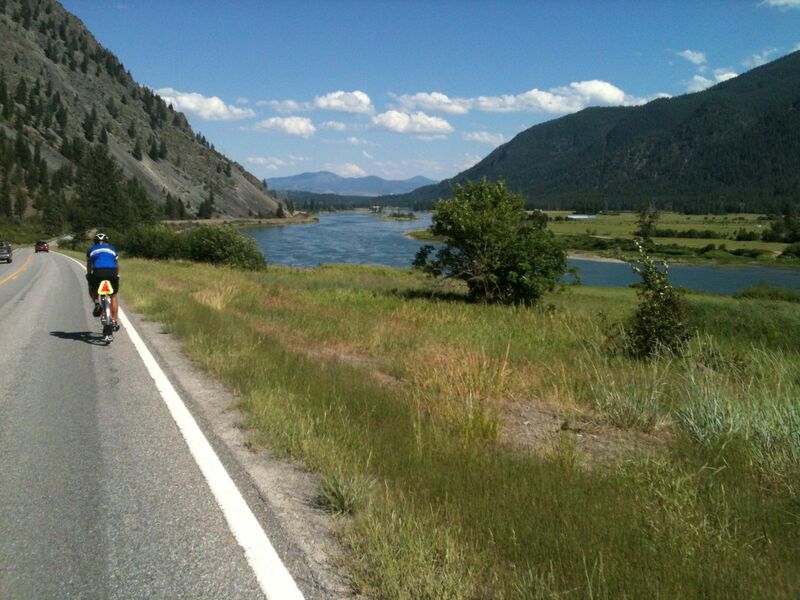 Our route for the next few miles followed the Clark Fork River on a gently rolling road with no shade. We looked longingly at the river below, but there was a railroad track and a tall fence between us and the water. We stopped at a business that had a faucet outside, but the water was turned off. At one point, we passed a group of houses. One of them had a shade tree, and a lawn with a sprinkler! I yelled out to Andy and made a quick U-turn. Surely the residents wouldn’t mind us trespassing in their yard for a little relief from the heat! The sprinkler water was so cold it took my breath away as I rinsed my head and helmet. I soaked my bandanna which I wrapped around my neck, and my socks, but the relief only lasted a few minutes. On shorter rides, I try to only stop at controles. A lot of time is wasted when one stops, so the best way to build up a reserve of extra time, or to finish inside the time limit, is not necessarily to ride fast, but to simply keep moving. This ride was different though, the heat made it important to stop at every opportunity in order to cool off, take on fluids, and eat a little. Twenty-five miles after Thompson Falls, we pulled into the grocery store parking lot in Plains. A fellow randonneur had passed by not long before us, we could tell because he left a bag of ice on the table out front. We bought some nibbles for the road and some ice cream to eat there while we sat in the shade. Even though it was after 5:00pm, the thermometer read 99 degrees. I looked at my phone and since there was a signal, I alerted the ride organizer that we had Ken’s controle card. He graciously agreed to record Ken’s finish time and then transfer it to the card when we arrived. From Plains, the course again heads across the grain of the landscape, which is to say we have to climb some more hills! The first one lasts for five miles, but the countryside is beautiful. We pass a ranch for sale, and another one where longhorn cattle are grazing. One hill gives way to another and we pass fields where farmers are making their evening rounds to turn on irrigation systems in the cool of the evening. There is a Conoco gas station near the town of Hot Springs so we stopped again, this time for microwave ravioli and a 20oz lemonade. Fellow rider Chris was there icing his knee when we pulled in. Precious minutes ticked by and the lessons learned during shorter events told me to leave, but really, it was no longer critical. We had only a bit more than a 100km to go, but twelve or thirteen hours to do it in. I savored my canned ravioli and watched the people filling their cars at the pump; a local in a pickup, tourists in an SUV, three young folks in a run down Volkswagen Beetle. Last year after my dnf, I got to see this part of the course from the passenger seat of the ride organizer’s car. It was no less beautiful this year, but my sense of time and distance was distorted by the experience. I kept remembering important landmarks and thinking they must be just over the next rise, or around the next bend, only to realize that they were still miles ahead. We caught up to Chris who was having more and more trouble pedaling due to knee pain. A small saddle adjustment seemed to bring him some relief and the three of us made good time for several miles. Twilight deepened and we switched on our lights. A screaming fast descent brought us to the shores of Flathead Lake. Just like at home, following the water’s edge means rolling hills. We pushed hard, but didn’t make it to Lakeside before the store closed. So much for our last opportunity to buy any ice cream! Luckily there was a pop machine, so we had cold drinks and some crackers. Chris’ knee was hurting badly again so we rode with him for moral support. He didn’t ask us to and I’m sure he would have been fine on his own, but I know if I was in his shoes, I would have been happy for the company. At the north end of the lake, we finished with the worst of the hills and were soon in Kalispell. Somehow in my memory, the northern outskirts of Kalispell had blurred with the southern outskirts of Whitefish so after we got through the downtown, I was looking for the finish on every street corner. Reading the route sheet and doing a little simple subtraction (not so simple at this stage!) reminded me that we actually had another 15 miles of rolling terrain. There was no danger of not finishing at this point, but I wanted to be done as soon as possible so I could sleep. Finally, as the sun was rising, we turned into the parking lot of the hotel. John singed our cards, took our picture, congratulated us, and then we went to bed. Andy had the presence of mind to ask the hotel clerk for a late checkout, so we were able to sleep until noon local time. Our train wasn’t until late evening, so we had lots of time to while away. The first stop was the Loula’s, a wonderful local breakfast place. We met up with some of the other riders and shared our experiences of the ride over a wonderful meal and then stepped out into the boiling mid-day sun just as the restaurant closed for the afternoon. In our fatigued state, it felt critical to get out of the heat, so we went around the corner to the Great Northern Brewing Company to relax over a pitcher of IPA, and more stories. Very late in the afternoon we felt recovered enough to collect our belongings from the hotel and ride to the train station. One of the wonderful things about this ride is returning by train. I would far rather return by train than by car or plane simply because it’s possible to get up and walk around. The other reason that the train is better than flying is Amtrak’s bike boxes: they’re huge! Turn the handlebars, remove the pedals, roll the bike into the box, and tape it up. We still had time to kill after the hard work of bike packing, so we went out to dinner, and then to ice cream. At breakfast the next morning, still on the train, we started planning the next big adventure. This entry was posted on August 10, 2013 by Thompson Custom Bicycles. It was filed under Uncategorized .